I don’t know about you, but I need to read more to help me with my business. And, given we’re headed into the summer holidays, I thought I’d put together a reading list to help you pick a couple of books to keep your business moving! The first four on this reading list are ones I’ve read and heartily recommend. And, whatever your business, you’re definitely going to need the first two! I’m not a natural salesperson. But, this book is teaching me how to be. Written by The Entrepreneur’s Godmother, Alison Edgar, this book gets to the heart of how to sell. And it’s not what you think either. Digging into her experience, Alison gives you a system. But more than that, she helps you to understand the different personalities you’ll come across when trying to make a sale. The nub of this is that you need to know people, and Alison gives you a good overview, coupled with an anecdote or two! If you haven’t read this book, then you don’t know the potential of your digital marketing. I love Warren Knight! He breaks it all down and makes it easy to understand. That’s a winner in my book. From websites to email marketing, blogging to social media, there is practical advice on how to make it all work for your small business. Do you look at someone and wonder how they became so successful? Their success may not be what you think. This book looks at all sorts of people, from rock stars to professional athletes and reveals that it’s as much about where we’re from and what we do as who we are and that not even a genius ever makes it alone. I seriously love Malcolm Gladwell; he really makes me stop and think. In this book, Simon Sinek says you can do one of two things to get people on board with you and help your business thrive. You can manipulate them or inspire them. I expect you guessed that he recommends the inspirational approach. And key to this is the reason why you started your business in the first place. Sharing this with others who are on the journey with you, including any employees, will get them behind you. Stop focusing on what you do and zero in on why you want to do it. Do you know your why? Now on to books that are on my list! This book by Michael Hyatt is all about setting goals. You know that I say you should have goals for all the marketing you do? Well, it’s no different for the other parts of your business, or even your life. If you have big goals, quite often they can get pushed for other things that are more pressing. Or, even worse, forgotten altogether. This book shares a proven, research-based system for setting and achieving your goals. Sounds like a winner to me! The premise of this book is that there are too many people spending too many hours at work. Sound familiar? The author, Morten Hansen, says they are working hard, but not smart. The book covers the “Seven work smarter practices” that can be applied by anyone looking to maximise their time and performance. Each chapter has questions and key insights for let you assess your own performance. There are also mini quizzes and questionnaires and a strategy to become a more productive worker. We all need that, don’t we? When I read the full title of this book, by Scott Gerber and Ryan Paugh, I was a bit surprised. In case you’re wondering, it’s: Stop networking and start building business relationships that really matter. It was the stop networking bit that took me aback. However, when I read further, I knew that I’d have to read this book. It’s all about those people who understand that they’re not collecting business cards, but building a relationship. Essentially, this book shows you why it’s time to leave those bad networking habits behind and really start to build relationships. Sounds a bit airy-fairy, doesn’t it? But it’s really not. It’s about how to look completely differently at your customers. Essentially, Jay Baer has written a customer service book for today. It covers how we all think of customer service in terms of the telephone and email and build processes centred around those channels. Of course, that’s changed so much. We all rely on social media to receive customer service from the companies from whom we buy. How often have you complained online only to have your complaint go unanswered? That’s right! This book really digs into why your customer service needs to be fit for today. Eeek! How many times have you felt overwhelmed? I know, me too. That’s why this book, by Gino Wickman, sounds great. It’s not about the day-to-day hiccups you experience, but those big, fat things like frustration, losing control of the business and becoming burned out. Wickman has come up with an “Entrepreneurial operating system” to deal with frustration, burnout and associated problems. I’m thinking that quite a few of us will want to read this one! So, we’ve dealt with the big obstacles you might come across with Traction. Now, let’s deal with the everyday problems you might come up against. Clate Mask and Scott Martineau help readers by offering a different approach to problem-solving. And, even though it’s earmarked for new business owners, I think anyone who runs a small business can identify with the feeling of putting out fires all the time. So, if you’re after a book to help you change your mindset, this is the one. Take some time this summer to work on your business. Any of the books on this reading list will help you do just that. I’d love to know which ones you decide to read and what you learned from them. 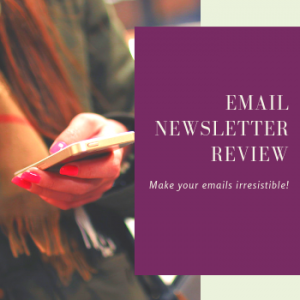 If you liked what you read, why don’t you sign up to receive my weekly newsletter?